I found Julia’s work when I discovered that my FSH was 46. I was 38 at the time. 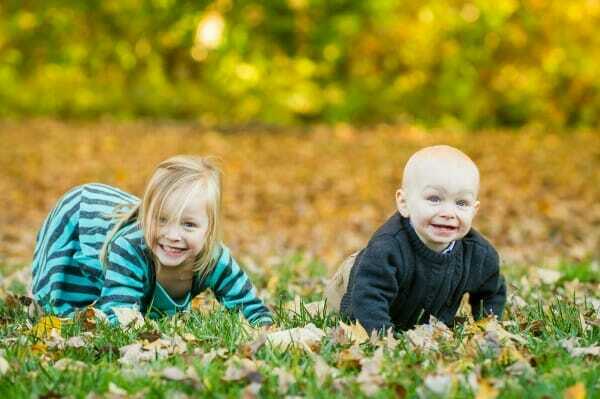 My daughter was only 9 months old and we were trying to conceive our second child. Investing in a trip to Woodstock was a crazy leap of faith, But I was compelled to go. I tried one IUI and gave up on her. She said that she would not try IVF on me because it would not work. Later, ok, much, much later, when I developed a sense of humor about my situation I joked that she did not want to mess up her numbers with my old eggs. The news of my “infertility” completely devastated me. My husband came home early from work that day after I called him sobbing. I was inconsolable. I was embarrassed to be “infertile” and did not tell anyone for over a year of my situation. I finished Inconceivable the day my husband was having surgery to fix his varicocele and a week after I discovered my diagnosis. I became hopeful. 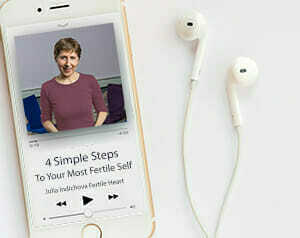 The Fertile Female was like food for my soul, so I quickly joined the Fertile Heart teleconferences led by Julia and dove in head first into the practice. I jumped on a plane and went to the workshop and came back with a renewed hope. Going to the workshop was a crazy leap of faith, but I felt compelled to go. After the workshop, I decided that medical intervention was not for me, so I changed my diet and saw a naturopath. The naturopath did not go so well. Here is part of that story. After that I stopped acupuncture and all herbal remedies and stuck with just USANA Essentials daily. Last year we tried one natural IUI which was unsuccessful. Then, last summer, I started hearing other women on the phone circles talking about adoption and donor eggs and how they were ready to walk that path. I wondered how they had gotten to that point, without feeling like they had “given up.” On one of the calls Julia explained that if she hadn’t gotten pregnant then she would have continued to practice the tools because it became a way of life and she would have chosen the next step that would have organically unfolded for her. Last fall that is exactly what happened to me. As I was faithfully doing my imagery it became apparent that I was unattached to how our child would choose to come to us. I just knew that it would happen. In the fall, after weighing all options, my husband and I decided to adopt.. By December, we were approved and waiting to be matched with a Birth Mom. We were told that the process was happening quickly and to be ready, because we probably wouldn’t be waiting long. In the meantime, I continued my Ovum practice and “created space” for life to spark. Julia talked about that often in the phone circles, but I didn’t believe her. However, I had NEVER felt better about myself. I felt alive and hopeful. It was a great combination. I also began to notice that the Meeting Your Child Halfway Imagery (the one that’s on the Fertile Heart Imagery Two CD) became an almost palpable experience. I knew that we would meet out child soon I assumed that it would be through a Birth Mom, but I have also never “given up” on my own body. I was open. I was around 6 weeks pregnant when I took a test. I did not track periods, ovulation, temperatures or anything of that nature for over 9 months. I had all of the normal period symptoms so I just kept waiting. As shocking as it was to see those two dark pink lines, a part of me was not at ALL surprised. Julia’s work helped me to trust, follow the longing and the truth I felt inside. Even when it was hard, I kept walking. Sometimes I would stand still and complain and the tears and pain throughout the process were unbearable, but it’s all been worth it. Our journey was filled with twists and turns, heartache and joy and I wouldn’t change any of it. I am 21 weeks and am due this November. I took the workshop 2 years ago and was a very active phone circle participant for about a year and a half. I still have Orphans (many, some days) but I trust that everything is and will unfold just as it should. I will always be grateful to Julia and her amazing work. During my journey, I lived for the success stories that would occasionally be posted to the Fertile Heart site. If you are walking toward your child I hope that my story inspires and lifts you up just when you need it. An update; It’s a boy! 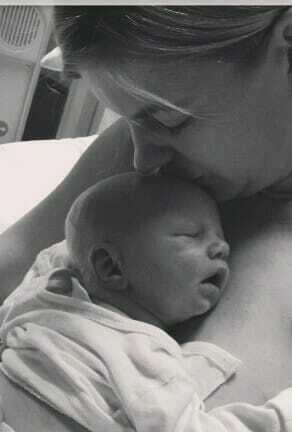 Tracy’s baby boy, Cole David Palmer, was born on November 9, weighing in at 7.11lbs and 21 inches. This is such a wonderful story that indeed gives me so much hope! practice practice practice, and just doing all I can and the best I can makes me feel hopeful. Thanks so much for sharing! Thank you Julia for your work which shines like a beautifully paved and well lit path in this sometimes dark journey. I have read and re-read this blog so many times and it gives me such hope each time. I frequently picture myself like Tracy in the picture with my little girl’s arms around my full belly. One thing that I keep reflecting on is that even though I may not know why I have been placed on this journey, I am now beginning to see that perhaps this path is the way to a fuller, more fruitful life. (Thats a fertile thought)! I have re-read this story multiple times and find joy and hope each time I read it. I feel really connected to Tracy’s story at this point in my fertile heart journey. I thank you Tracy for sharing your journey and also Julia for your beautiful practice that continues to open up my inner networks so my healing of orphans can continue to flow out and my visionary can be strengthened. This is an amazing story. Thank you for sharing it with us – every bit of positive information helps on the journey of “meeting our child half way”. I look forward to our next teleconferencing session next week. It’s my pleasure to inspire others. I promised myself that if/when I became pregnant or birthed my baby through adoption I would share my story. I will be forever grateful to Julia! I love this story, it gives me so much hope, my FSH is a lot lower and I’m only 35 but I am getting the egg donor speech from every doctor I see. Such an inspirational story. Julia said much of what this woman quoted of her at yesterday’s workshop and it’s reassuring to read it here also. I too, believe this work is an ongoing process and sometimes the outcome doesn’t show up how you originally ordered it but it is just perfect the way it is. The timing on this article is truly divine- I needed this today. I am so blessed to have found Fertile Heart and to have been introduced to all these lovely ladies. Counting the days until the workshop Julia! a question of allowing yourself to walk toward that family of yours with a little deeper recognition of your gifts. Thank you so much for sharing this beautiful story. I used to feel so discouraged when I would hear people’s success stories, and my orphans would tell me that that happens to other people but not to me. But, something has shifted in me. Last night a friend of mine shared her success story after 5 years of trying and I noticed that I actually felt nothing but joy for her, and I even wanted to hear about her pregnancy. And, I felt the same when hearing your story. May you have a healthy pregnancy and new baby, and an amazing new life as a mother of two. I so needed to read this right now. Congratulations on your wonderful pregnancy.